Churchill Downs announced NBC will air the first of three "Road to the Kentucky Derby" telecasts of Derby prep races. The first day falling on Saturday March, 27. This day will show the Louisiana Derby (GII) live and the Lane's End Stakes (GII) on the USA Network. The goal is to go beyond the horses and give insight to lifestyles. The result will be a nice hype for the Kentucky Derby and exposure to the common fan. There will be handicapping and races, but my guess is that if you are only interested in those aspects of the racing game, you might want to stick to TVG or HRTV. Other races that are being featured include; The Santa Anita Derby (GI) from Santa Anita Park and Wood Memorial (GI) at Aqueduct on Saturday, April 3. 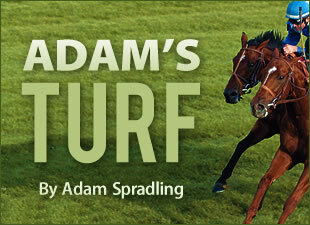 The Toyota Blue Grass Stakes (GI) at Keeneland and Arkansas Derby (GI) from Oaklawn Park on Saturday, April 10. I had the opportunity to watch a portion of KET's new documentary named "Thoroughbred." The film covers the 2009 racing season from Dubai, to the first Saturday in May and all the good stuff in-between. The owners, breeders, jockeys, tracks and history of racing are well explained. Maybe I could compare Thoroughbred as a mix of "The First Saturday In May" and "On The Muscle." The big difference is the scope of the film covers a broader expanse of the industry than just California and just the Derby. At least from the thirty minutes I was able to watch. Have you watched this episode of HRTV's Swale yet? If not, you really should. It explains the great story behind several influential families and farms in our industry and how Swale was that one horse that changed the world of many. In a way, it has a very James Dean like story that unfolds.